What is it about the animal figures that have recently been populating Johannes Steidl´s works? Be they birds, turtles, hares or fish, they are everywhere, yet peculiarly intangible. They don`t hibernate, don`t crawl ashore to nest, and don’t fly thousands of kilometres to far-distant winter habitats. They`re not illustrative, nor do they graphically embody human intentions or actions. They have as little to do with hunting as they have with the themes of vegetarianism or intensive livestock farming. In Steidl`s case, making art-historical interconnections is a difficult and ultimately jejune undertaking. When Franz Marc writes, “When I was very young I thought man was `ugly`; to me, animals seemed more beautiful, purer, but in animals too I discovered so much that was repugnant and ugly that my portrayals became instinctively (due to an inner compulsion) more and more schematic, abstract” (1), his words express a complicated moral and aesthetic judgement on animals and man that Steidl might find abstruse, although a link between ethics and aesthetics is by no means foreign to his work. The dual role, adopted by the artist Beuys, of shaman and advocate – “trees, animals, everything has been deprived of rights. I would like to gain legal capacity for these trees and these animals. That is a self-evident duty of man” (2) – might have a certain appeal for Steidl, but he still distances himself from it in his own work. Steidl`s hare is a pronouncement on its running movements, an electrified outline that vanishes along its contours. The turtle is simply just there. Its large presence could fill a whole hall without us learning anything more about it, other than the fact that it exists. 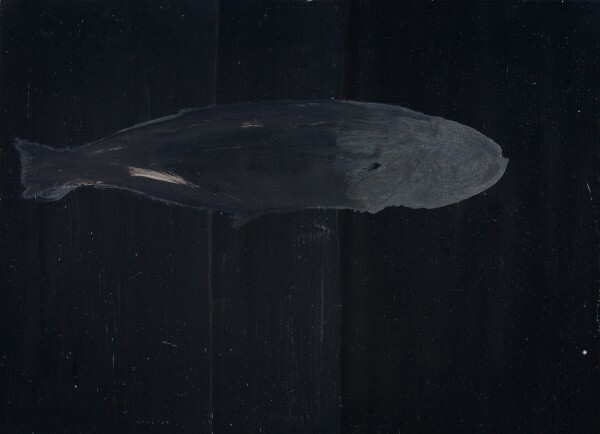 Black fish almost dissolve in the, for the human eye, impenetrable darkness of the sea`s depths. But why? And for what purpose? For a long time Steidl`s painting prowled the gestural and mimetic area of the human body. But the body is surrounded by an invisible wire fence, it tarries in the sphere of the human. Even where it involves something esoteric, it is inherently familiar. By contrast, the animal remains something alien, apart from the house cat and the milk cow. It really only exists in the context of human volition, man`s meaningful contexts. By deliberately refraining from creating any such context, and by keeping his calligraphic translations onto paper or canvas indeterminate, Steidl uses the animal as an ideal medium for his decontextualisation, a kind of clearing-out of all the rubbish accumulated in the mind with a view to smoothing the way for a contemplation that is as unintentional and pointless as possible. Johannes Steidl`s work is indebted to enlightenment, not apotheosis. Its impact is more disenchanting than enchanting. It evokes asceticism in an era of delirious consumerism – another reason why we follow him along his way gnashing our teeth rather than strewing flowers. The questions he raises may almost be as old as painting itself, but they have lost nothing of their validity and significance. Over the course of time, painting has repeatedly seemed to be at an end. Much more often however, that end has been treated as a foregone conclusion. So what Boris Groys claimed about philosophical questions also applies to aesthetic issues: they never come to an end, they are never resolved, and one is also never delivered from them. 1 Franz Marc to Maria Marc, 12 April 1915, in Klaus Lankheit, Uwe Steffen (eds. ), Franz Marc. Briefe aus dem Felde, Munich: Piper, 1982, p. 64. 2 Antje Oltmann, »Der Weltstoff letztendlich ist … neu zu bilden«. Joseph Beuys für und wider die Moderne, Ostfildern: Ed. Tertium, 1994 [also disseration, Munich University], p. 103. 5 Ludwig Wittgenstein 1919 to Ludwig von Ficker, cited from P[eter]. M[ichael]. S[tephan]. Hacker, Einsicht und Täuschung. Wittgenstein über Philosophie und die Metaphysik der Erfahrung, Frankfurt am Main, Suhrkamp, 1978, p. 116 (transl. here by Pauline Cumbers). 6 Ludwig Wittgenstein, Diaries 1914–1916 (transl. here by Pauline Cumbers).